The Jewish holiday of Sukkot is also known as the Feast of the Tabernacles and the Feast of the Booths. In 2017, it occurs 4 October through 11 October. 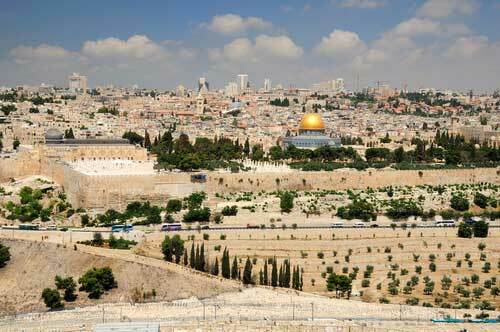 It commemorates the 40 years that the Israelites spent wandering in the desert after the Exodus. During this time, the Israelites lived in temporary, portable structures. “On the first day you shall take the product of hadar trees, branches of palm trees, boughs of leafy trees, and willows of the brook” (Lev. 23:40), and “You shall live in booths seven days; all citizens in Israel shall live in booths, in order that future generations may know that I made the Israelite people live in booths when I brought them out of the land of Egypt” (Lev. 23:42-43). It is therefore customary for Jews to build temporary structures during this holiday, and you will see them popping up throughout Israel. This structure is called a sukkah. They are built with a least three sides, and the roofs are thatched to provide protection from the sun during the day but still allow the stars be to be seen at night. Children and adults alike enjoy decorating the sukkah, and people will spending time eating and even sleeping in the sukkah. During this time, you will also see people with the four species: palm, myrtle, willow (lulav), and citron (etrog). In Tel Aviv, you can check out the Four Species Fair at Kikar Rabin on 2-4 October this year. Here, you can find Sukkah decorations as well as the four species, plus a general festive atmosphere. In Jerusalem, you can find these items at the Machane Yehuda market (also known as “the shuk”). The largest sukkah in Israel is erected each year in Safra Square in Jerusalem, so this is something you definitely will want to check out! Most businesses are closed the first and last days of the holiday. Mazada Tours will continue to offer tours throughout the holiday. We would love to see your Sukkot pictures! Please tag us on Instagram with #MazadaTours so we can share in your Israel experience.